Make sure you have installed the SiteOrigin Widgets Bundle and that the Post Carousel Widget is activated in the the Widgets Bundle interface under PluginsSiteOrigin Widgets. For more information see our Getting Started guide. Navigate to the page or post on which you wish to display a Post Carousel, click the desired row and cell and click “Add Widget” to open the “Add New Widget” dialogue. Click on the SiteOrigin Post Carousel widget to insert it into the chosen row and cell. Hover over the widget to display further options namely edit, duplicate and delete. To create or edit a post carousel, hover over the widget and click on the “Edit” button. The SiteOrigin Post Carousel edit dialogue will appear. Type the post title into the Title field provided. Click on the “Build Post Query” button to launch the Build Post Query dialogue window. Here you select the post type from which you wish to choose content to populate your post carousel. By default “All” will be selected. Here is where you will enter the Post, Page or Media ID’s you wish to include in your post carousel. If you do not know the ID’s you can click on the “Select Posts” button to open the Select Posts dialogue and search for the posts you require from the Post Type specified above. Click in the Add Post search field and begin typing the name of the post you wish to add. When the post title appears click on it to add it to your post carousel. Once you have finished selecting posts, click “Finish Selection”. Here is where you specify any custom taxonomies. Click on the drop down menu to specify how to order posts within the post carousel. 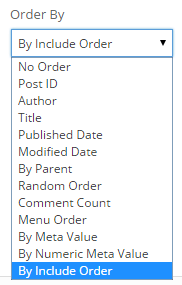 The default order is “By Include Order” meaning as they were added when they were selected. Click on the round arrow icon to specify descending or ascending. Set the number of selected posts you wish to display in the post carousel by adjusting the value in the Posts Per Page field. Leaving the Posts Per Page field set to Zero will display all the selected posts. Once you have complete Building the Post Query click “Save Query”. Click “Preview” to view your post before publishing. When you are finished, update or publish your page or post. Click view page to see the live result.